These small rusks mature slowly before being slowly baked. They are made from whole wheat flour (20%) and whole rye flour (80%). Grounded in a stone mill, the rye flour gives the product intense aromas with light notes of roasting and a rich flavor. It cannot be described as too hard or fluffy. It has a moderate hardness and is very crisp. 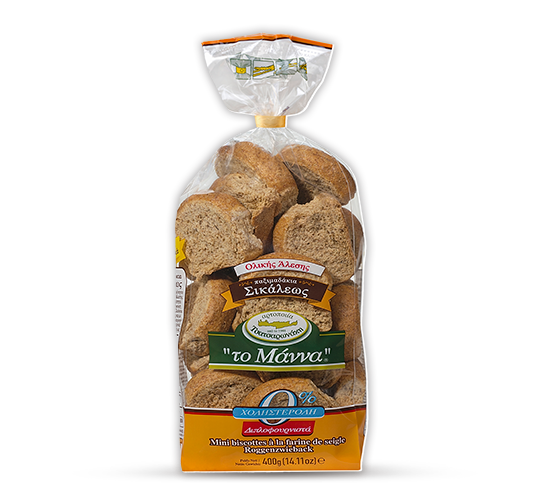 The package contains small rusks that are irregular in shape as they are hand cut. Containing only 2.5% fat, a portion of these small rusks contains proportionally half the amount of salt as one serving of bread. In addition to fiber, it also contains a variety of nutrients and phytoestrogens (lignans) with antioxidant properties; lignans are particularly effective in dealing with severe colorectal diseases and in the improvement/reduction of blood glucose levels. Rye also contains fiber (soluble fibers) associated with the reduction of bad cholesterol (LDL) which slow down the absorption of glucose (sugars) in the blood. This feature is of great importance for both those who are diabetic and those who want to be protected from the disease. Their crisp texture makes them an ideal companion for one or more main meals during the day. They can also be enjoyed as a tasty snack in combination with other ingredients, since they are rich in fiber that helps in feeling full more quickly. This, in combination with the right choice of accompanying foods at each meal, can either lead to weight loss or weight maintenance.